I’ve had this scallop recipe saved forever but it never got made because scallops are just so ridiculously overpriced here. I can get them from the grocery store closest to me but I’d consider the quality semi-sketchy. My only other alternative is Wegman’s where they’re sometimes as high as $32 a pound. My aunt and uncle who live in Delaware have a hook up with a guy who runs a restaurant there and I really need to get in on their next order since his prices are entirely reasonable and I know they’re of good quality. Anyway, I just so happened to catch scallops on sale at Giant right before the Fantastical Food Fight event was to happen. The theme for this month is seafood and I cut it really close, making these only a few days before, but I’m so glad I finally got to make this recipe as it was absolutely delicious. The Fantastical Food Fight is hosted by Sarah of Fantastical Sharing of Recipes. Each month an ingredient or theme is chosen and bloggers need to make a new-to-their-blog recipe using it. The possibilities are endless and all of the bloggers link up and share their recipes on the same day. In this case, today! The theme of “seafood” gave me such possibilities to choose from, but I haven’t been very interested in shrimp lately, none of us are fans of fish and crab meat has been even more expensive than anything else. Seeing as we hadn’t had scallops in ages, it was the perfect recipe to make. 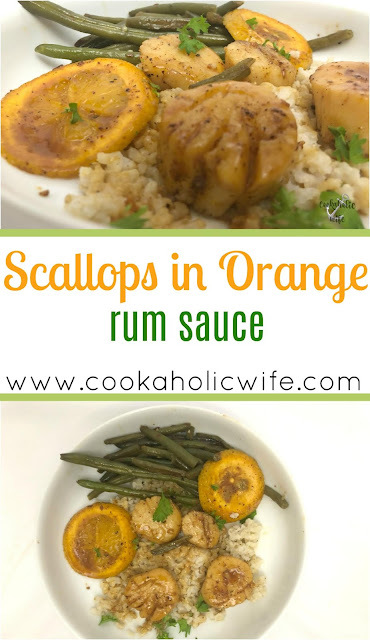 Sea scallops are caramelized and then coated in an orange rum sauce. 1. 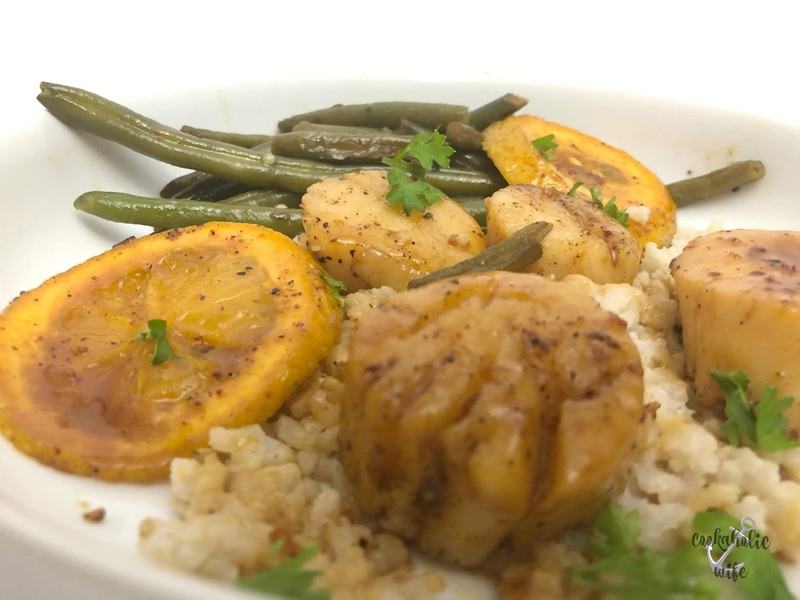 Place scallops on a plate and pat dry with a paper towel. 2. Drizzle 1 tbsp olive oil over the scallops and sprinkle paprika, crushed red pepper, salt and pepper on both sides. 3. Add the remaining ½ tbsp of olive oil to a large skillet over medium high heat. Add the garlic cloves and cook for 2-3 minutes or until the garlic is golden. Remove garlic from the pan and discard. 4. 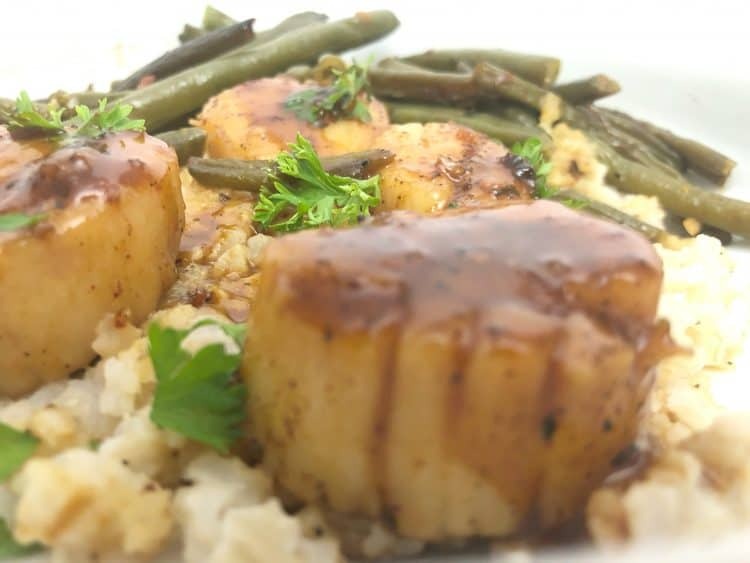 Use tongs to place scallops into the skillet, cooking for 1-2 minutes on each side or until golden brown and seared. 5. Transfer scallops to a plate and set aside. 6. Lift the pan from the heat and pour in the rum, then place back over the burner and use a spatula to scrape up the browned bits from the bottom. Add in the orange juice and orange zest. 7. Simmer until the mixture reduces by half, then stir in the butter. 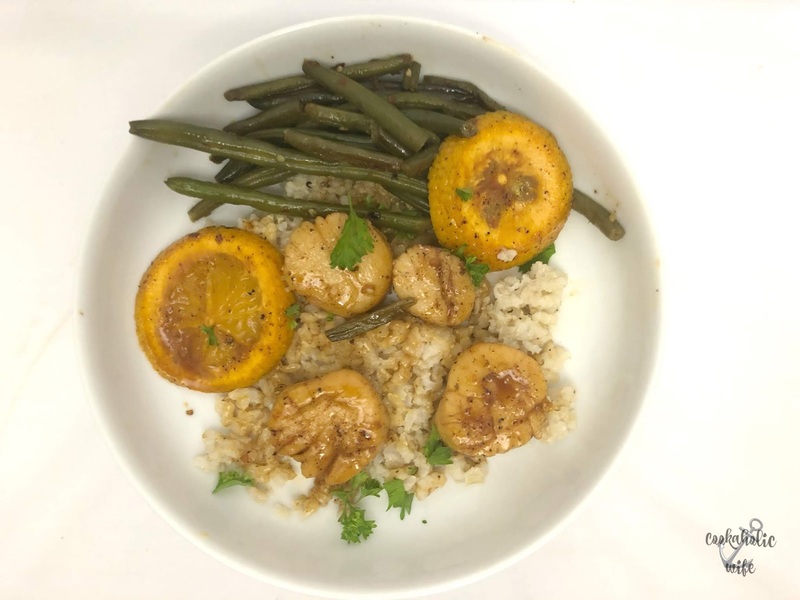 Once the butter has melted, turn off the heat and return the scallops to the pan, along with the orange slices and sprinkle the parsley on top. 8. Spoon the sauce over the scallops then divide among plates. I served this dish with brown rice and spicy green beans. The scallops were perfectly tender and the dish had the perfect amount of sweetness from the orange juice and heat from the crushed red peppers. Tom said it’s one of his favorite dishes that I’ve ever made, which was surprising because he doesn’t usually like anything savory that involves citrus. These scallops sound delicious – I adore scallops, but as you said the price is pretty crazy so they are a treat! I love scallops. They are my favorite shellfish! This recipe sounds delicious. Will be adding it to my list! I'm loving that sauce Nichole. So glad you were able to enjoy these scallops.